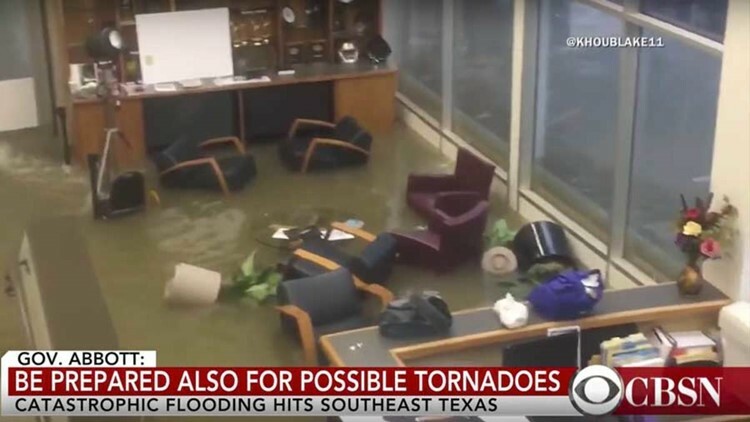 Our former lobby was flooded by Sunday morning, August 27th, as our studios were destroyed from the flooding caused by Harvey. BROOKS'S BLOG: **NOT A CURRENT FORECAST** As we approach the one year anniversary of Hurricane Harvey slamming south Texas a Cat 4 and Houston as a flooding tropical storm, I'm reminded by the uncertainty which still exists in tropical forecasting. HOUSTON — We knew days out that Harvey would be a flood-producer. We were fresh off the Memorial Day and Tax Day floods and knew what 15"-20" of rain can do to Houston. If the 30"+ of rain that computer models suggested may fall actually did happen, we'd be in for a new day in Houston. Thankfully officials and media distributed this potential to everyone who needed to know just in case the seemingly unthinkable forecast were to come true. In fact, I remember telling KHOU anchor Rekah Muddaraj the Wednesday before, in casual conversation that this storm could change our lives for a very long time and that everything we know as normal today may not be by the weekend. I wondered if I was just being dramatic. Due to our collective, "normalcy bias", no one thought it would actually happen quite to the degree that it did. While we did flood, Houston escaped the wind threat. Unlike the flooding, those big winds are something no one saw coming and if Houston had received the Cat 4 gusts Rockport endured, damage would have far exceeded Ike. Fortunately for us, the wind threat dissipated before any of that came to Houston. That said, the hurricane winds weren't even supposed to happen if you'd gone to bed on the 23rd and didn't bother to watch the weather the next morning, on the 24th! The discrepancy between forecasts just 18 hours apart is shocking considering it's 2018 and our technology far exceeds what it did even 10 years ago. AUG 23, 2017 - Just days after the National Hurricane Center (NHC) had issued a final advisory while it was in the central Caribbean Sea, pending potential redevelopment as it headed west, Harvey found new life near the Yucatan Peninsula. The cone was re-issued.... A tropical storm was expected to hit the Texas Coast! AUG 24, 2017 - 18 hours later the NHC changed the forecast radically. Harvey would slam Texas as a MAJOR hurricane of Category 3 or greater strength. Texas had less than two full days to prepare for what would go from a rainy weekend to a total monster. 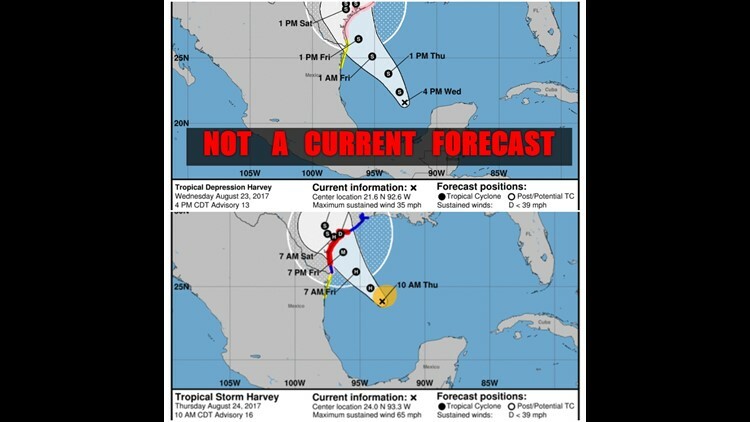 I remember asking our chief meteorologist, David Paul early that evening if he thought a, "stronger Harvey" in the sense of winds could translate into bands of heavier rain than forecast by computer models, since the cyclone would be more organized. He responded, "Oh, certainly... a hurricane verses a tropical storm could amplify the definition of those bands and the intensity." AUG 26 ... Harvey slammed Mustang Island and Rockport shortly after dark. Port Aransas recorded a gust to 132 mph. Before the center made it much farther north than 59, it weakened to a tropical storm ... and stalled. It would then flood the city of Houston in a way unmatched in modern history for the next 18hrs. AUG 27 ... Houston flooded and by daybreak the KHOU 11 News building on Allen Parkway was deluged beyond hope. Operations were ceased 57 years after opening at that location, forcing our station to broadcast from temporary studios (where it remains today) at the University of Houston, inside the KUHT facility. I remember wondering how possibly over 30" of rain could fall. No one could imagine over 56" falling in the hardest hit spots in the Houston Metro (Friendswood and Mary's Creek) and over 60" of rain falling in Beaumont. No one could have predicted that Harvey would rapidly intensify from a 'nothing' to a 'legend' in less time than it takes to work a day's shift. It's that time of year again and thankfully there's nothing going on. It's the quietest in the Atlantic for this period in nearly a decade. Let's hope this trend remains. As the hurricane season has really just started as of August 1st (95% of activity happens after that date, even though the season begins June 1st) it's unlikely to remain so quiet.